President Trump’s star on the Walk of Fame in Hollywood, California was vandalized two times in one day this week by an unhinged leftist. TMZ caught the lunatic on camera Thursday vandalizing Trump’s Hollywood star. A man dressed in all black took a black marker and drew a bunch of swastikas on Trump Hollywood star then walked away. 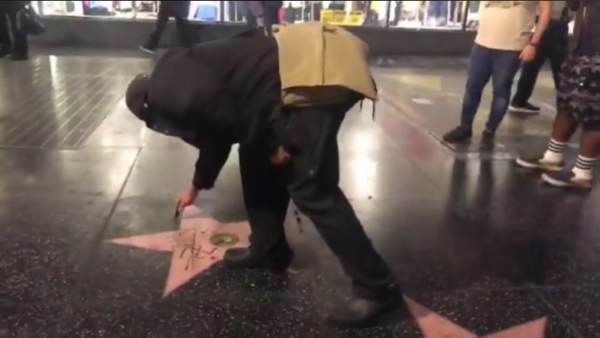 It appears the same man came back later Thursday night to vandalize Trump’s Hollywood star again after it was cleaned. The man in the second video is wearing the same outfit and carrying the same man-purse. In July, a far-left vandal destroyed Donald Trump’s star on the Hollywood Walk of Fame with a pick axe.